Ford showcases the all-new 2018 Ford EcoSport in a new ad, promoting the Marvel Studios’ “Guardians of the Galaxy Vol. 2”, in the US theaters starting May 5 and in the UK theaters starting July 31. 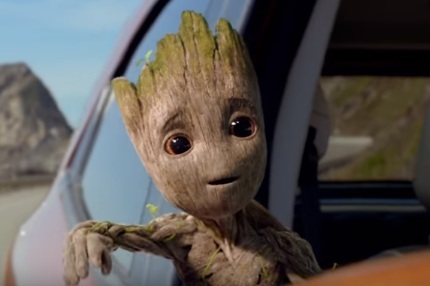 The 30-second spot features a young woman at the steering wheel of a 2018 Ford EcoSport (a preproduction model is shown), in front of a movie theater ruling “Guardians of the Galaxy Vol. 2”, who receives a toy representing Baby Groot (Groot is the extraterrestrial tree monster from the film) as a birthday gift from her boyfriend. Looking at the box, she starts dreaming about the moments she’ll spend in Groot’s company. But a pleasant ride in her car turns into an adventure, with airships on their trail, shooting at them. to do eventually by passing through a tunnel. The spot ends with the boyfriend being shushed by her when he’s trying to say something and with the voiceover urging you to “be the guardian of your galaxy with the all-new Ford EcoSport”. The song playing at the end of the ad is “Fox On The Run” by British glam rock band The Sweet, from their 1974 album “Desolation Boulevard”.